I know I've said it before . 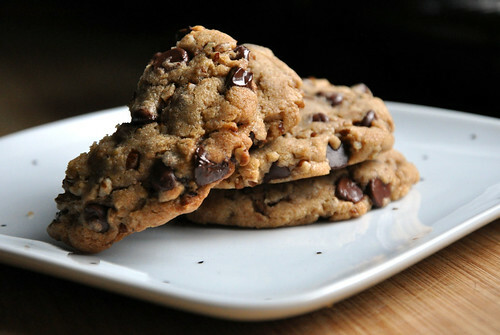 . . and I'll likely say it again: These cookies are THE BEST cookies I've ever made. Sunday afternoon, I had a craving for chocolate chippers (those of you following us on Twitter heard all about it, too!). But I didn't want to make my usual recipes. Nope, I wanted to try out something that promised good results. 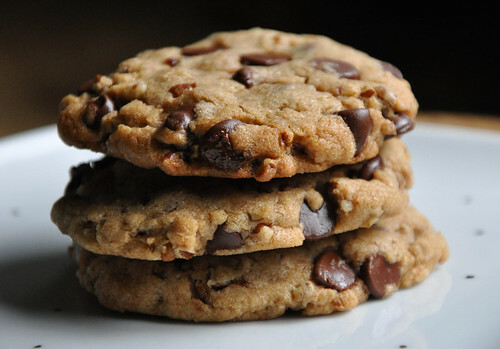 So, I Googled "ultimate chocolate chip cookie recipe" and started searching for methods that would work well when adapted to be vegan (I prefer baking without eggs and dairy for health reasons). Then, I found this recipe, which focuses on some precise techniques, and literally ran to the kitchen. As I started pulling out my ingredients, however, I noticed I didn't have a single cup of all-purpose flour in the house. Nope. I had bread flour. Whole wheat. And white-whole wheat. 1/2 cup of wheat pastry. Yikes. If there's one thing I've learned in all my baking, it's that flour matters. Use the wrong kind, and you risk disaster. But I forged on, and I'm so glad I did. The mixture of white-whole wheat and whole wheat flour worked extremely well. And it enriched my recipe with nutrition. 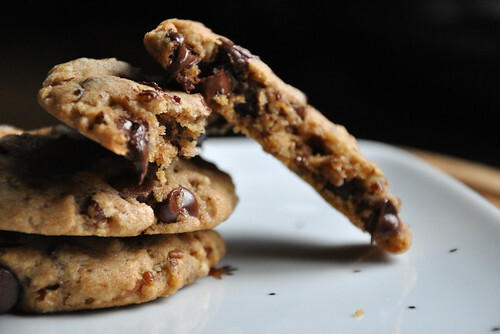 If you're hesitant, maybe try making a half batch. Or use all purpose and wheat pastry flour. Trust me, though, these cookies taste a great as they look. Just remember to follow the instructions carefully. Let Earth Balance warm to room temperature. 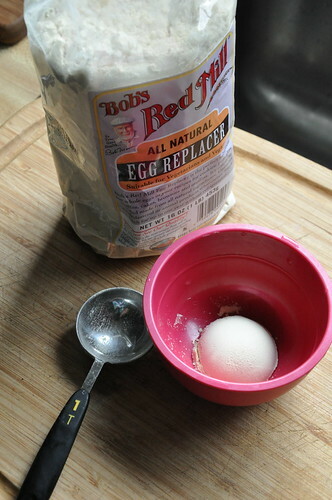 Whisk together your egg replacer in a small bowl and set aside. Whisk together the dry ingredients in a medium bowl and set aside. In the bowl of an electric mixture, use the paddle attachment to beat the Earth Balance at medium speed until it is lighter and clings to bowl (30-45 seconds). Keeping beater at medium speed, add both sugars. Continue to cream butter and sugars for a total of 4-5 minutes, scraping down bowl as necessary. When done the mixture will be light and fluffy. Whisk egg replacer with vanilla in small bowl and add it to the butter and sugar mixture, keeping beater on medium speed. Beat for 3-4 minutes. 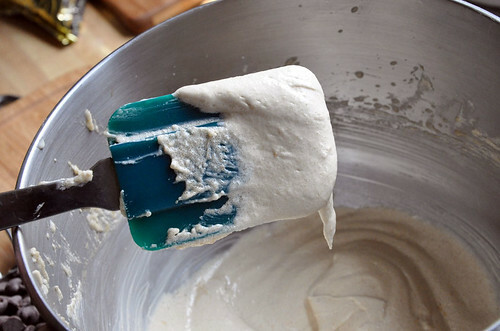 The mixture should appear fluffy, like whipped cream cheese (see photo above). Put mixer on slowest speed and add the dry ingredients. 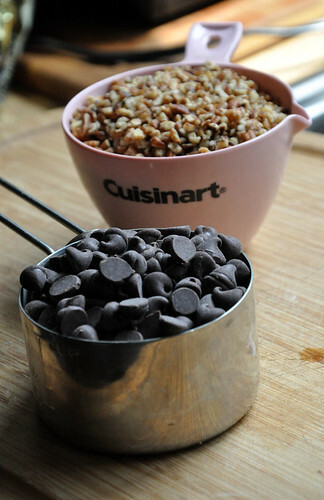 As soon as the dry ingredients are incorporated, add chocolate chips and pecans. Leave beater on lowest speed for a few seconds to mix it all together. 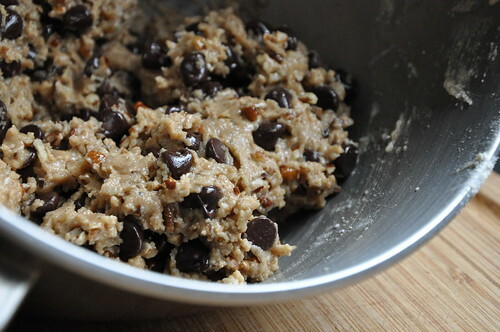 Line a cookie sheet with parchment paper and scoop heaping tablespoon amounts of dough onto it. No need to leave space between then at this point -- because when you're done scooping, you'll want to refrigerate the dough for between 2 and 4 hours, covered. Once the wait is over, preheat your oven to 400 degrees F. Remove to-be cookies from refrigerator and let warm to room temperature (30 min.). 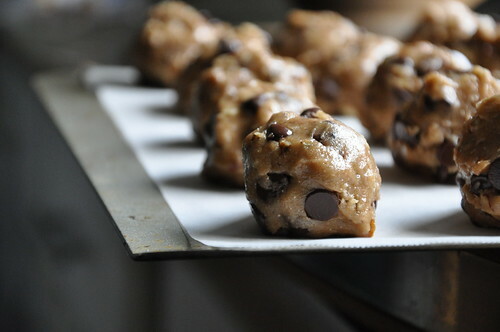 Keep cookie balls on baking sheet lined with parchment to bake. But before putting them in the oven, you'll need to space them like you would for "normal" cookies -- and then flatten with the palm of your hand just slightly. They'll look like small hockey pucks. Bake for between 8-10 minutes. Edges should be golden brown but center pale. I used two different kinds of cookie sheets for this -- thinner needed only 8 minutes to bake, thicker, the full 10. To finish, let sit at room temperature 5 minutes before taking off baking pan. And it's not too late to take part in our upcoming week celebrating healthy living!!! No story is too insignificant or unimportant. Silly or boring. It's ALL good. All you need to do to be included is to email us (neverhomemaker [at] gmail [dot] com) what made you care about your health/fitness/nutrition. Anything goes, really. And if you have a blog address, be sure to include that, too. A photo would also be fantastic (can be of anything related to what you write). We've already received some WONDERFUL submissions . . . and we're excited to post them for you next week. So, what are you waiting for? Send us your story now: neverhomemaker [at] gmail [dot] com!